Why did Jesus weep? Why did he tarry those 4 days? Why did he talk about how many hours of daylight there was in a day? I hadn’t really considered until right now that maybe Jesus got angry. I had merely regarded this story as one of Christ’s miracles and how wonderful it was. Why four days? Jewish people of the time believed the soul hung around the proximity of the body for 3 days after death. Once three days had passed they viewed there to be no possibility whatsoever that the person would revive. Jesus of course would’ve known all of this, so he lingered. Why ? Because this would be a great lesson for all the unbelieving Jews who would see this miracle performed in broad daylight. Four days was just the right amount of time to make his point. Why did Jesus weep? This part at first I just took for granted he wept because his friend had died, but then I thought about it…Jesus KNEW he was going to resurrect his friend of course so he had no reason to cry for that! Was he crying because everyone else was hurt? Again…Jesus knew he was going to resurrect Lazarus so why would he need to weep for their sadness when he was about to reverse it!? My husband came up with the BEST answer, an answer I had never considered……Jesus wasn’t weeping because he was SAD Lazarus died….or because he was SAD that everyone else was hurt….Jesus was weeping in FRUSTRATION. You see, by the time Jesus was “weeping” he had already tried to tell Martha Lazarus would rise but Martha wasn’t “getting the picture”….and Mary had already blamed him for not coming sooner.…Here stood Jesus in the midst of all these unbelieving Jews and 2 of his closest friends Mary and Martha who believed but didn’t seem to “get it”….Jesus was standing among people who were saying things like “this guy can make blind people see, he could’ve saved Lazarus”. People all around him crying, of course he was deeply moved in spirit! He was moved by the realization that although he had taught and taught and reached out and taught and performed signs and wonders these people STILL DIDN’T GET IT! Now in the beginning Jesus had said to them “ARE THERE NOT 12 HOURS IN A DAY?” and referenced how men stumble in the dark. Jesus knew that if this miracle were performed by night, people wouldn’t believe, so he had already set a plan into motion. 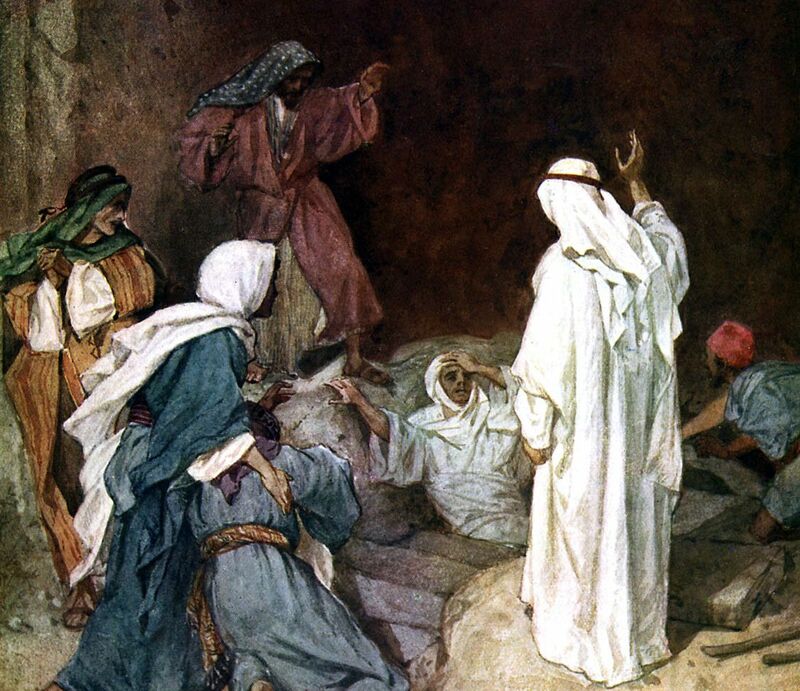 He would raise Lazarus in broad daylight in front of a large group of people and this would lead them to believe. Many times in my life I have felt like God was “too late”, many times I have doubted his ability to resurrect something I considered rotting in the grave, many times I am sure I have frustrated him! I know though that he is able and that it is my own lack of faith which hinders me. Many times after I know I must have frustrated him, he has moved in “broad daylight” to perform wonders in my life….and because of this I have a testimony to share and hopefully will lead others to Him! Take heart, there’s no situation too far gone for Jesus. Don’t worry if he tarries a little longer than you wish he would, don’t fret if the thing you’ve been praying for seems to fall to the ground in front of you, because Jesus is coming and with him he will bring a resurrection you never thought possible.